I really enjoyed the book because it was an interesting blend of fantasy and historic fiction. My favourite part of the book was when the main character becomes bonded to the ghost of the bear and they become friends. I would give this book 4 stars out of 5. 'A Skinful of Shadows' is a great book full of mystery, secrets and the supernatural. However I do not think it focuses too much about the time and context, although it does not mean it is not present, but it is not the theme of the story. But it is a very good book that I would recommend to anyone interested In ghosts and the supernatural. It is about a girl called Makepeace. One day she finds herself responsible for her mother's death and all alone. She is acting strange so her uncle sends her to live with one of the most powerful families in England, who are also her father's family. She meets her half-brother and they try to escape. They try to find out more about their family secret, but they find out more than she wants. Maybe she's now got to hide more than one secret? With her wild tempers, which come from inside, does she really know whose souls are inside her? A Skinfull of Shadows is an amazing book. I would recommend it to people who like adventure/mystery books. I think it is Frances Hardinge's best book because her writing and description really brings you into the book, as it is really realistic - even the ghostly elements. It was very interesting learning about that time in history. It is a bit confusing if you don't know about life in the 17th century and leading up to the English Civil war but you still can understand most of what is going on. Makepeace is a very strong yet weak and powerless character who I felt sorry for from page one. The story of the 'bear hearted girl' is a thrilling tale involving ghosts, family and betrayal. Makepeace is a girl who doesn't know her real name or even her father. When troubling dreams disturb Makepeace's sleep her mother sends her to a graveyard and this is how the story starts. I believe that the book is very enjoyable. However it contains little historical references which I see as a let down as 'A Skinful of Shadows' has been entered in a history competition. The book can be slightly confusing at the beginning, but you slowly start to feel for the book and its characters. Although the book focuses on a strange, confusing theme the book is definitely worth reading and opens your mind to how we treat animals and each other. In light of this I think that Frances Hardinge has created a beautiful book that should definitely be read and cherished. I really enjoyed reading this book and I feel some parts of it are very relatable. I liked the fact that the heroine was a young and empowered girl like myself, I feel in certain situations she was put in that I would have reacted the same way. In the beginning she had a difficult relationship with her mother and I know that is something that a lot of children go through and find hard to deal with. After her mother dies she blames herself because she's the one that led her to the dangerous streets of Grizehayes, there she finds difficulty with men in an inn and I imagine she felt very intimidated. Later on in the book she finds out about a brother she did not know she had and they go on all sorts of adventures together. A spirit finds its way into her mind and she battles to keep it hidden because she fears what would happen if someone was to find out. As well as keeping this huge secret she still manages to live an almost regular life of a girl her age. Makepeace, the main character, faces many challenges in the book put pulls through and reaches her goals. Her and her spirit companion stay together until the end of the book and have a long lasting beautiful friendship built on love and trust. There is a good use of adventurous language and normally when I read a book I can imagine the surroundings and make up what I think it would look like but with this book nothing is left the the imagination because everything is described so well I feel like I'm there. I really enjoyed the book because it was not something I was used to reading about. My favourite character in the book is Makepeace as she is very independent and she figures things out using little things around her. She is also very clever, even though she doesn't know how to read, Makepeace is a very creative person and most of the things she solves in the story can be related in real life situations. I thought some of the history in the book was realistic but, most of it wasn't since it is fantasy. Considering the fact that it was set a long time ago, certain people might have actually believed that ghosts entering people's body can actually happen. The book was very interesting and because I already read a book by the author I wanted to read it to see how good the book was. I just wanted to say the book is really weird in a good way but, it's very creative and I loved it. A Skinful of Shadows by Frances Hardinge is a historical fiction book set during the English Civil War. Sometimes when a person dies, their spirit goes looking for somewhere to hide. Sone people have space within them, where these spirits can hide. Twelve-year-old Makepeace has learned he defend herself from the ghosts that haunt her in the night. However, one day a dreadful event causes her to drop her defence. Now a spirit is inside of her and it might be her only defence when she is sent to live with her fatherâ€™s rich and powerful ancestors. A civil war is imminent between the King and Parliament and Makepeace must decide what she wants to do with her life. This book was extraordinary from the start because of the exhilarating storyline, sudden plot twists and amazing detail. It's an enjoyable read which I have found unputdownable from the start. Frances Hardinge constantly adds new elements which keeps you thinking about the storyline. For example when Makepeace recruits a ghost to help her, Frances Hardinge has added a completely new element to the storyline and makes the reader think about what has happened in more detail than written. Quite a lot of history is mentioned in the book. The King (Charles I) is at war with parliament and all citizens much choose their side, dividing the country into two. All of the counties mention are historically correct, for example Oxfordshire and Staffordshire. Only the plot with Makepeace, necromancy/witchery and Makepeace's ancestors (including Grizehayes, her ancestors home) don't exist as they're just part of the storyline and have been made up by Frances Hardinge to make the story more interesting. I would give this story 5 stars for its exhilarating storyline, sudden plot twists and amazing detail. This story by Frances Hardinge has made me want to find out more about the the English Civil War with Parliament against King Charles I and read more historical fiction stories. It has also made me want to read more books by Frances Hardinge because I thoroughly enjoyed this story. 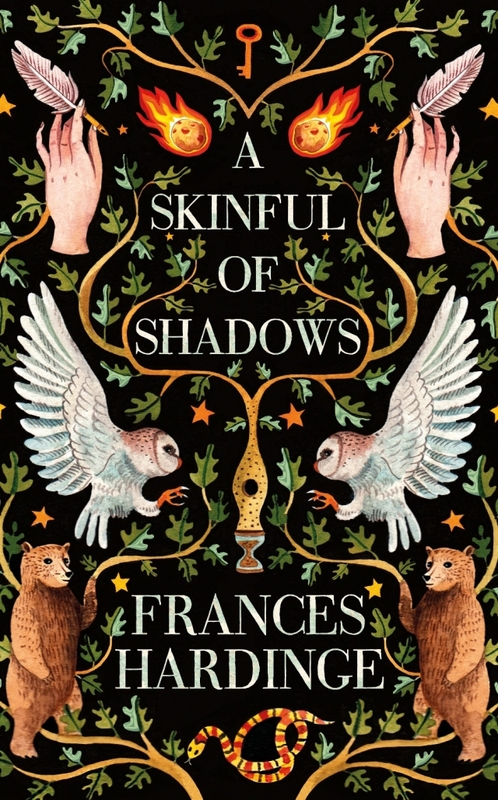 The book 'A Skinful of Shadows' was written by Frances Hardinge and is the story of a 'bear-hearted girl' and her journey with a spirit inside her. It is a beautiful tale woven with a blend of death, power, resilience and strength of a girl in an upside down world. Frances Hardinge is the Costa Award- winning author, from her book 'The Lie Tree' 2015, and has written many books with a female lead and in a historical background. 'A Skinful of Shadows' is not that much different to her normal style of writing as she has also written another fantasy fiction called 'Cuckoo Song'. The text is set just before the English civil war, and follows the life of a young girl, Makepeace, who lived in a puritan community. She and her newly found aristocratic family have the power to take in the spirit of a ghost and become a vessel for its spirit. One day Makepeace is taken over by a spirit and it gets inside her. It is strong and brutish but it could be her only defence against her father. When first starting the book it was slightly confusing what time period in history it was set in. However, as I continued reading I noticed that the historical elements were smartly inserted with different hints for the reader to follow; it was a great use of show-not-tell, which was really lacking in other elements of the book. The English Civil War was the period in which the book is set in and although there are many references to names, hierarchy and etiquette at the time, this is not the books prime focal point. The historical background and evidence is merely used as a setting and is not really a fundamental part of the story. Â Early on in the story it mentions Makepeace's scarring encounter with smallpox, where she thought she was going to die, this is a clue to the historical background of the text. Later on in the book we find out is set just before the English civil war when suppositions about witchcraft and witches began to arise, and in 1645-1647 the chilling witch hunts were unleashed on the public, who were already suffering from the extremity of the civil war. The use of making Makepeace an outcast in her society and even in her own family, fits in with the overall image of witchcraft as anyone in that era that was seen as strange or peculiar was accused of being a witch. Makepeace's name is also a very common puritan style name as we are told that it represent 'making peace' with the community. Many puritans of the 16th and 17th Century used virtue names like: Fear-God, Praise-God, Silence, Humiliation, Creedence and even 'If-Christ-had-not-died-for-thee-thou-hadst-been-damned' These names were given for lots of different reasons; Humiliation for example was given to children to remind them of the pain and suffering of the world. Makepeace was a real puritan name and is the also the name of the novelist, William Makepeace Thackeray. It is thought that the name Makepeace was used right up to the 19th century, at least. The main character of the book Makepeace, was, in my opinion, a very weak and dull character. I felt particularly, at the start of the book, that there was no character development, so I didn't really feel as though I knew her; I had a lack of interest and very little investment in Makepeace. Another element of the story that I feel further prohibits the reader from really forming a bond with Makepeace is the fact that most of her feeling are told to us; therefore, there was inferring her feelings or any sympathy towards her, it is all fed to us, which prevents the reader from having a personal connection with the main character, Makepeace. I feel that it is particularly important to show a character's feeling rather than just spelling them out, as it gives the reader the opportunity to go on a journey with the character and empathise with them through their troubles. This is the element where 'A Skinful of Shadows' starts to fall, due to the lack of connection that Makepeace has with the readers, it really makes the bookÂ tedious to read; at some points in the book I felt as though I was swimming through mud, rather than gliding through the book. Makepeace doesn't have a very strong relationship with her mother as they are often disagreeing with each other, they also don't seem very loving. The writer tries to give the impression that Makepeace's mother is very stern and even frightening at times, however she also contrasts this by saying that they were not really a part of the family and that â€˜their place in the family always felt loaned, as if it could be taken away again without any warning. From this I got the impression that the mother is actually quite weak when it comes to standing up for herself to her family and not as fierce and stern as she is with Makepeace at times.Â (SPOILER ALERT) I would have really loved for the mothers character to have been more developed at the start of the story so the when she died it had more of an impact. I felt that her death was very predictable and even quite a few pages before her death I knew she was going to die. Moreover, the writer could have used this as an advantage to build suspense and give the reader an almost anxious feeling, to keep them wanting more. However, it just felt very lacklustre; this for me was very disappointing as considering it was the death of one of the central characters at the time, I just didn'tparticularly feel that it was strong enough. What also let me down was Makepeace's response to her mother's death, which again felt was very watered down and not intense enough for me to be fully engrossed in the book. Although, my view may be slightly biased on this as I didn't empathise with Makepeace'scharacter from the beginning. I would recommend this book to readers around eleven or twelve, who are fairly new to the young adult genre. I believe younger readers will enjoy 'A Skinful of Shadows' as it is a step into more adult-like books in its framework with a brilliant twist on dark fantasy. There was an element of beauty in the detail of the story, however; many descriptions of the more thrilling events left me wanting more extremity. I often felt a little disappointed that certain events were not as chilling and intense as I assumed they would be; it felt a little watered down for a 'Horror' but not completely a 'fairy tale' either. Combining a fairy-tale with elements of horror is a stark contrast and I think that this works well for younger readers. For me, this is a genre that I love and would readily dip into, so for the most part I often found myself comparing it with my favourite books; it just didn't feel as intense and gripping as I thought it might from my high expectations.